The Australian Department of Industry, Tourism and Resources is the key organisation which looks after the overall growth of the Australian industry. The Department operates various programs which increases the efficiency and sense of competitiveness between the Australian industries. Some of the major industries of Australian economy are—manufacturing, finance, ship building, information and technology, agricultural, mining, insurance, aviation and telecommunications industry. As a result of these sectors, the Australian industry has become one of the leading industrial sectors in the world. Australia is a country which is largely dependent on its agricultural industries. Agriculture has always been one of the primary sources of income for Australian people. Earlier agro products accounted to about 80% of the total export goods but now it has gone down to 3% of the total export. Despite the decline in agricultural exports, even now, about 370,000 people are engaged in farming in Australia. Although the agricultural industry has witnessed a fall from its position during the 1970’s, it still contributes largely towards Australian economy. Australia was one of the largest exporters of beef and wool in the whole world and the third largest of wine and wheat even in the year 2005. Mining industry is one of the chief industries which have led to the growth of population in the Australian continent, right from the time when gold was discovered in Australia. Mineral and fuels top the list of Australian exports. The total export value of minerals has risen by 21% in the year 2006 as compared to that in 2001. The Australian manufacturing industry is well-developed with al modern amenities being used for the manufacturing processes. The major manufacturing units include machinery and equipment, metals, wood and paper and others. The ship building industry of Australia is one of the most important industries in the Australian economy. Western Australia is considered to be the leader in terms of high speed and lightweight ship building. Currently, Australia accounts for about 30% of the international market share for aluminium shipbuilding. The Australian aviation industry is growing rapidly because the country depends largely on its internal airports. The main units of the Australian civil aviation industry are the international airlines sector, general aviation sector, safety and the domestic regional airlines sector. 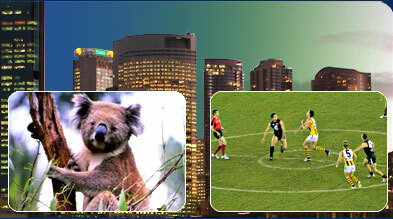 Australia places a great importance towards banking and insurance sector industries. The Australian insurance market is one of the most stabilized and has been providing insurance solutions to people down the ages. Insurance solutions in Australia are provided by competent firms and legal advisors who are experts in their fields. The information and technology industry of Australia contributes about 38% of the global IT market solutions and is the third largest in the Asia-Pacific region. In the total global economy the Australian information and technology industry accounts for US$38. This industry of Australia has witnessed a rapid growth in the past few decades and has helped the country to secure a strong position in world economy. As Australia is one of the most developed nations of the world the telecommunication industry of Australia is one of the most advanced sectors. The leading company which dictates the Australian telecommunication industry is ‘Telstra’. Few other telecommunication companies operating in Australia are Telstra, AAPT, Powertel, Optus, Telecom, Primus, Soul and Vodafone. Mitsubishi and Toyota are the two major Japanese automobile manufacturing industries in Australia.